AGS: Simon, thanks for sending your words all the way to Australia. Starting with a fairly inane question: how should we pronounce your surname? Is the ‘h’ silent? SM: As Cantrell says in The Quick and the Dead: correctly. As for the ‘h’ – I’ve never really thought about it. Probably without is classier. Inevitably, at school my nickname was ‘Messy Pants’, so if you’re struggling that’s a fall back for you. Anyway, thanks in advance for interviewing me! Looking forward to see how Australians react to what I’ve always been told is my ‘British sense of humour’. You gave us Mad Max and Neighbours – I give you Sirens. AGS: Sirens is your first original novel, a dark comedy of absolute power and mind control. What should readers expect? How much of the plot can we reveal without spoiling it? SM: First and foremost, I hope it’s a page-turner. Something original that goes beyond genre. It’s funny and horrible, I think, in the way that Kind Hearts and Coronets is funny. I’m very keen to avoid being pigeonholed as a genre writer and I hope Sirens appeals to anyone from fourteen to one hundred. I also wanted before I died to write a book that even if I was the only person to like the thing, it would exist. And look where we are now! There are elements of Sirens that could be construed as satire. I like big, sweeping novels and so that went in. When I started the first rewrite, I saw that Anthony’s story could be seen as a metaphor for neo-liberalism, or the rise of populist politics or anything you wanted, none of which I intended. Even if that’s true, none of that really matters except character and story. Above all, I wanted it to be entertaining and, if possible, a book you can read in a day. AGS: Compared to other books in the Doctor Who range your previous novels stand apart for being less focussed on — less reliant on — the Doctor and his companions. One might say you’re more attentive to world building; to the needs of the scenario itself. Was it a relief to cast off Doctor Who’s constraints in exploring the dark wish fulfilment of Sirens? SM: The Doctor, at least the classic Doctor, never develops; he never learns from his experiences. He is already a complete character – morally perfect. He has to be, or he wouldn’t be the Doctor! I struggled with making that interesting because in a book you don’t have a great character actor who can muddy the waters and bring in some humanity. I didn’t want to ‘explore’ the Doctor’s character because that would, for me, miss the point. It’s too easy. I hated those books that did that because, for me doing that was chickening out. It was also done in a very adolescent way and I was a lot older than that. What I see as virtues in humanity are essentially undramatic – empathy, good manners, unselfishness, modesty, restraint. The only way I could make this work was to put the Doctor in amongst evil, selfish, arrogant people and reveal him as a quiet hero. Also, my Doctor was mysterious but he had no super powers. For me to like him, to care about him, he had to be a bit smarter than us, more fun than us, but vulnerable and capable of losing. All the other books seemed to have him as an invulnerable white wizard who used magic. He was essentially a god. Nothing interesting to me. After eight or so books, I’d run out of ways to make this work. I see in the programme now they have started to give the Doctor an internal life. End of mystery. Boring. The Doctor is the moral centre of his story. I often got criticised for having too many bastards in my books but that’s because you can’t have more than one Doctor! In Sirens, I got to have a character who could actually develop and learn. Okay, he doesn’t particularly learn the right things but Anthony, we can all see something of ourselves in him. He handles having his power about as badly as any of us would. Oh yeah, the question was about world building. Well, yes. I do go in for that but that’s because I’m thorough. I had no interest in Doctor Who continuity but I am pretty OCD about my own internal logic. I tried to create worlds that worked for the individual Doctor: Tom Baker in Valdemar given an opportunity to do what he does; a quiet, unassuming Patrick Troughton in a harsh version of Gerry Anderson, a Jacobean Tragedy for Peter Davison. My favourite world was Infinity Race which I wrote as a Jon Pertwee adventure but had to shoehorn into the Eighth Doctor’s universe where it didn’t really fit, so a reader didn’t see that mirror. AGS: Anthony is– how shall we say? Not an easy character to like. Were you wary of writing an entire novel from the perspective of an anti-hero? Or was it a case of: this is where the glamour fell; readers will just have to accept it? SM: Anthony is a very non-genre hero. He’s a very passive character who becomes a monster. I liked the idea of the hero being a loser. I have a phobia about people always wanting to go in and ‘do’ stuff to make the world better. Maybe the answer to solving our problems is just to sit on your hands for a while. Writers are constantly being told by script editors to write active characters. Well, what if someone wasn’t? Of course, Anthony is active really. He wants to survive in a hostile world so he can go back to watching telly. Part of the writer’s revenge was giving a shy ordinary working class person power in the world of the entitled, the confident and the good looking. Who doesn’t want to put them in their place? I always look for something different in a book. The ones that stand out for me have interesting, not particularly nice protagonists: Flashman, Yossarian. It’s the curse of coming up through the Seventies – there was a Greek Tragedy mentality where characters are tossed about at the whim of the gods. This view was wiped out by the ‘you can do it’ eighties when everything became Rocky. It’s an easier get: the infallible hero who’s also supercool. Sirens is interesting for me because there are no goodies. Anthony becomes a baddy but hopefully, the reader thinks that this is probably how they would end up, whether they like or not. AGS: In Sirens it is easy to construe an authorial love-hate relationship with London. Is that the case? Was it a frustrated daydream turned rotten by Murphy’s law that first set you to writing the story? SM: London is a great city and I’d always wanted to live there. I was arrogant enough to think I would become very successful there. However, London is a harsh town and it punishes any weaknesses. I always like the idea that it is the apex of a pyramid. Back in the Empire days, booty would be harvested from around the world and brought back to serve a tiny privileged minority who have no idea what it costs to sustain their standard of living. Obviously, London has become a shadow of what it was once; with the difference between rich and poor becoming wider every day. I started Sirens in 2006. I have no interest in it being some kind of prophecy but it didn’t take a genius to figure that unfettered capitalism was going to do some damage. AGS: In the Roman Republic a dictator could be appointed to see the state through a specific crisis, thence to relinquish his office. It has been suggested that Sirens is a satire of absolute power; but more specifically, that Anthony represents the people. His dictatorship, built on unfathomable popularity, is what would befall the world if the full, uninformed force of democracy were brought to bear on every aspect of government… Is there any truth in this? SM: I don’t know how much you know about the UK’s current madness, and its recent vote to leap enthusiastically over a cliff and abandon the European Union. Let’s just say: in 2006 when I started writing Sirens, I knew all of this in advance and had the talent to turn my amazing prediction into a novel. I’m not really politically aware and I have some daft, impractical old-fashioned left wing views, and I think the author’s job is to concentrate on the story. The theme is in the background, hiding. It’s up to the reader to find what they want. AGS: Your writing evinces a mixture of grim humour and realism/pessimism, yet also what seems a nostalgic fondness for pop culture. In some cases the influence is overt — in Doctor Who: The Indestructible Man, for instance, your homage to Gerry Anderson — but is there an underlying oeuvre that has shaped you as a writer (in much the same way that we here at Derelict Space Sheep still pine for the 1980s)? Was there any specific inspiration for Sirens? SM: A specific inspiration was I, Claudius (not that hard to spot). I’m probably influenced stylistically by Martin Amis and James Ellroy and especially Joseph Heller; much more than I should be. Quatermass is probably the sole biggest influence in my life; especially the 1970s version which burned into me at just the wrong time. I do have a kind of interest in the logic of fantasy worlds. I always wonder, in Lord of the Rings say, what an accountant in Gondor would think about being called up for the army to fight off a horde of orcs. Or even what an orc thinks about being thrown into a battle about which they know nothing. Indestructible Man was fascinating, trying to figure out how this planet with all that in it, fighting Mysterons, might actually turn out. This stuff was in my DNA. Plonking the romping, elfin Patrick Troughton, Jamie and Zoe into that horror was even more nasty fun. That’s how I roll. I’m not sure anyone should pine for the 1980s. Perhaps in Australia it was a cool decade – but let’s not forget Beyond Thunderdome! Unforgiveable. SM: Tales of Uplift was the closest I ever came to being successful as a writer. Even that was too weird really for television. I can’t help myself. One plays the cards one is dealt. You can’t even get it on DVD despite starring Rik Mayall. House Trafalgar is my big current project. I wrote a short version of it a few years back and a director friend of mine actually made it. We were very happy with the response when we screened the finished project. Although it seemed like a one joke premise — a suburban house is treated as a Napoleonic warship and has a battle with the house across the road — Mark turned it from a little satirical film about the British madness of property obsession, into a funny, accessible adventure movie. It’s a Star Wars where the SFX are all ordinary suburban things. Watch it here and make up your own mind! At the beginning of 2017, I was approached by a producer to write a feature length version and have just completed the first draft. We’re hoping to film it in the next year or so. AGS: As well as being a writer, you’re also an actor (hey nonny, nonny). If Sirens were optioned for film, could you see yourself playing a role? SM: I went to drama school and trained as an actor but at the grand old age of whatever I am, I can look back and see that writing nonsense for money was where I was really at. I still love acting though and get much more of a thrill from being asked to be in someone else’s tiny film or play than any amount of writing gigs. I spend a lot of time acting when I should be doing other more useful things to help my career. I’m about to start a run of a Eugene O’Neill play in Brighton, because I wanted to and was offered the part. AGS: And finally, since people have already contacted us to ask: besides such global awards as the 2018 Hugos and Nebulas (and possibly the Bram Stokers? ), what Anglocentric awards can Sirens be nominated for? SM: I wish I could tell you. Let me get back to you on that one. AGS: Simon Messingham, thank you very much. SM: The pleasure is all mine. Nothing I like more than talking about myself. 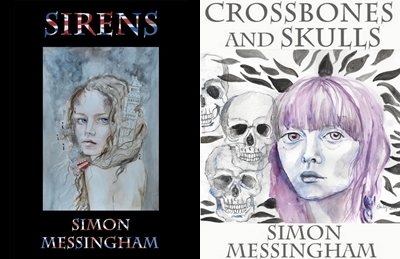 Simon Messingham is the author of Sirens, a cautionary tale of absolute power; and Crossbones and Skulls, a brace of pirate and zombie stories.